The Odysseus is an autonomous aircraft powered by solar. The aircraft is scheduled to launch in early 2019. To make it possible, the plane flies at a high altitude at 12 miles to operate above the weather. The Odysseus is powered entirely by solar power. 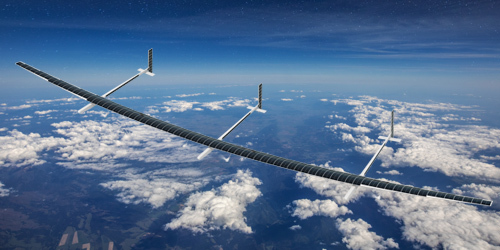 The plane has a large wingspan allows the engineers the fit a large sum of solar panels. At night, the plane uses the energy stored in the batteries. The body of Odysseus is made out of carbon fiber to keep the plane light. The body is covered by UV resistant film to keep the plane going for the long haul. It flies automatically like a satellite. It is not built for transporting passengers. Because of its high operation altitude, the proximity to the surface of the earth, and the cheaper launching cost compares to that of the satellite. The Odysseus is uniquely positioned itself to be useful to scientific research. It could reach difficult to monitor places on the earth, and functions as a communication satellite. It could also monitor the O-zone, and ice cap flows for scientists to collect data.